Have you got property or land for sale? Interested to see how much it may be worth at auction? Fill out the form below and a member of the auction team will be in contact to arrange a free no-obligation auction valuation. If you have any questions about property auctions, please call us, we’re always happy to help with any enquiries. 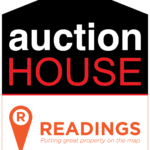 Auction House is the UK’s largest residential property auction company and here at Readings, we’re proud to represent them, covering the entire Leicestershire county. If you are looking for your next redevelopment project, buy to let investment, commercial property, land for a self-build, or simply a bargain property then call us to find out the next auction date, 0116 222 7575.